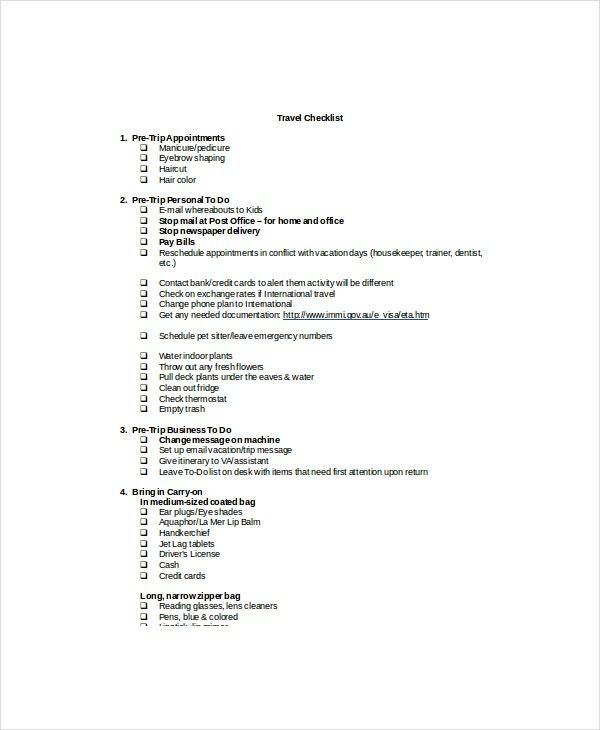 A travel checklist template helps you to create a list of all the items that you would like to carry with you during a vacation. Once you have all the items necessary for a trip, you won’t be confused about your travel plans. 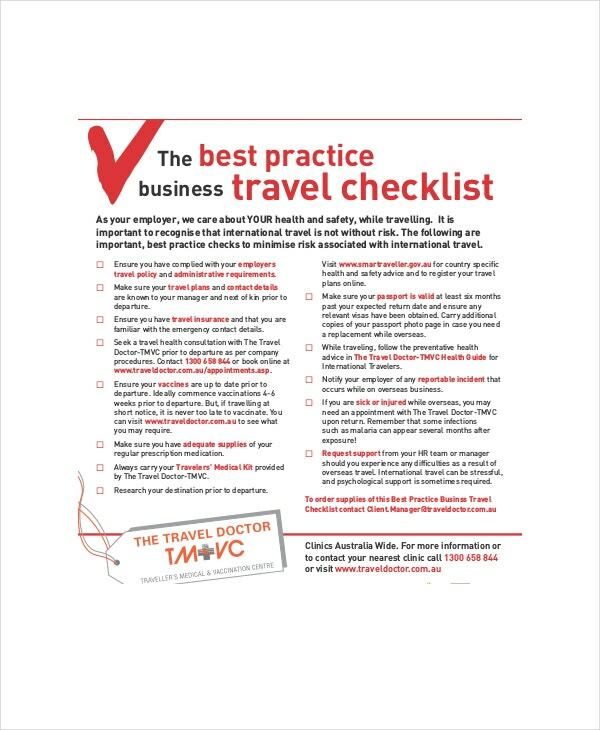 Although checklists for traveling are popular in the Internet generation, it is important to understand that the document isn’t necessary for short distance travel. Following is a list of the most common travel checklist templates for download. You can also see Word Checklist Templates. 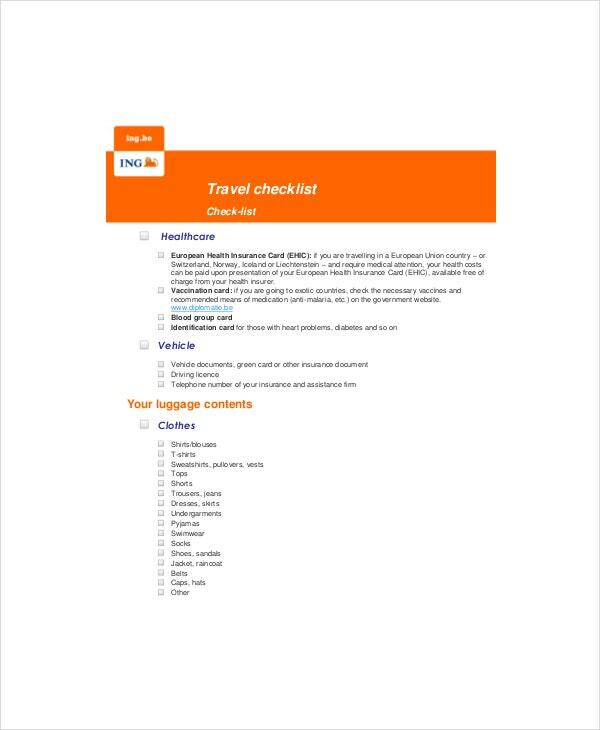 Write a list of all the items you will need during and after air travel using these Checklist Templates. Review the list from carefully, at least three or four days before you travel. A business travel can be fun and fulfilling only if you have the right tools with you. It will obviously be a combination of business and family activities, so your checklist template should cover both. 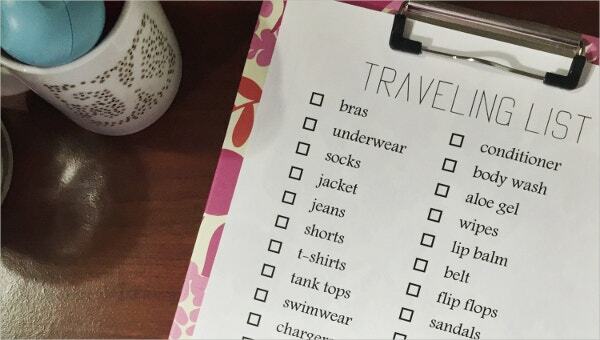 The next thing you do after making all your travel arrangements is t create a travel packing checklist. This list will help you decide what to pack for your travel and what not t carry. 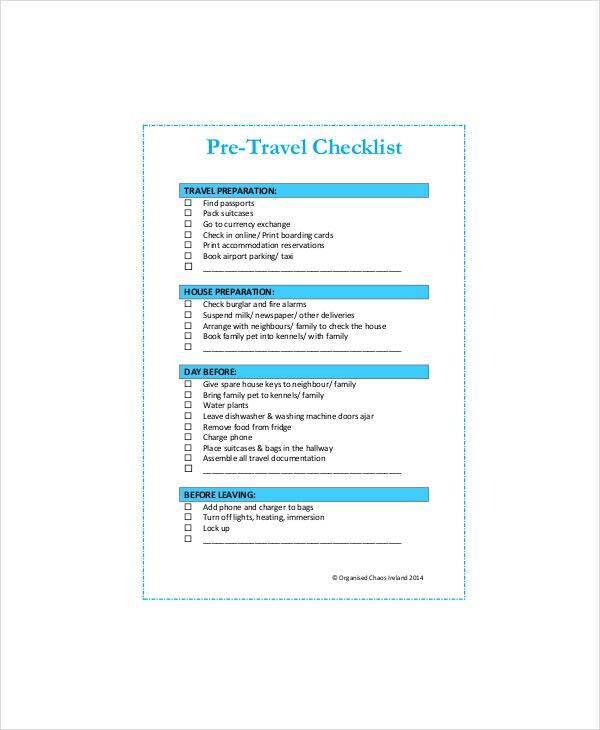 A pre-travel checklist template is a unique document that will help you plan your travel before the actual travel day. It helps you eliminate guesswork, and makes it easy for you to travel with peace of mind. You can also see Maintenance Checklist Templates. Download, customize and personalize this template for personal and family use. 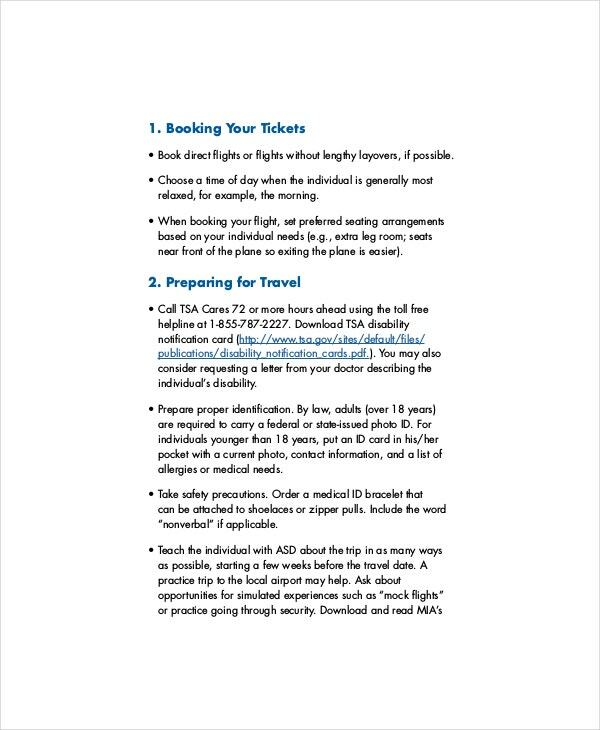 Plan your family’s trip before the event, and make sure you review the document from time to time. > What is an example Packing Checklist for Travel? Imagine you have decided that the following weekend if a family day, that you are going to take your family on a two days trip. The question is what are you going to carry with you during the official trip day? You cannot make such a decision off the top of your head. You can also see Inventory Checklist Templates. You will need to create a packing checklist and review it for accuracy before using it to plan your upcoming event. Your packing list should match the kind of trip you have planned. For example, if you are going to have swimming activities during the vacation, swimming costumes must appear on your checklist. > What is the Safe Traveler List? A safer travel checklist is the one that prepares you to handle money appropriately. A safer traveler checklist is the one that leaves no room for guesswork and inconveniences. You can also see Project Checklist Templates. A safer traveler checklist is the one that helps you to make your travel plans efficiently without leaving out any important detail. Review your destination.Contact the hotel manager in the town you are going to confirm if they already made a reservation for you and your family. Determine if there are travel warnings. You would rather be late for the trip, but safe home. Get travel insurance if you don’t have any. Make sure you sort your travel money before leaving home. Visit your doctor for a checkup. Create a checklist of foods you will eat during the vacation. Prepare to respect other cultures. 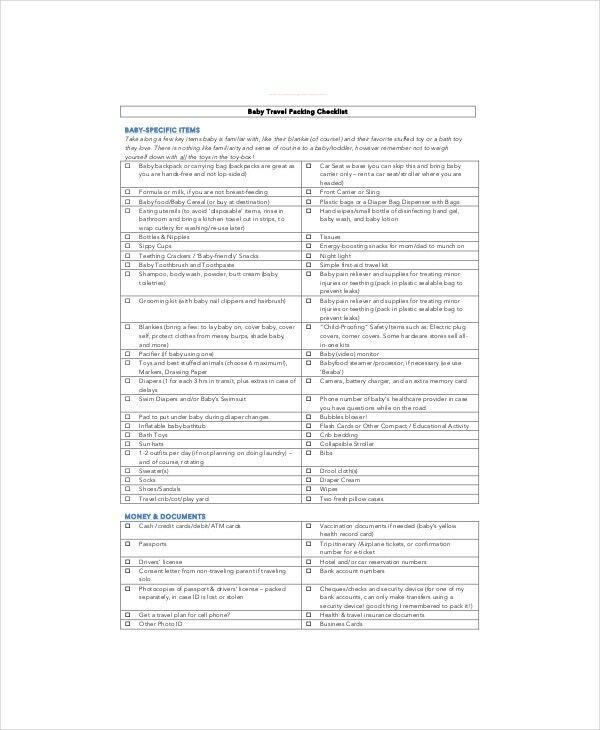 You can also see Training Checklist Templates. 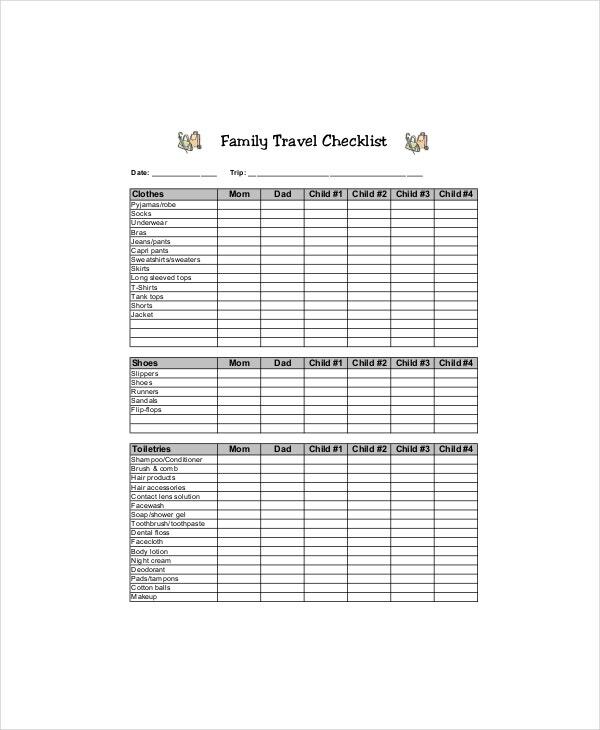 The beauty of a travel checklist template is that it eliminates guesswork by providing with all the details to need to plan your travel, your stay in your destination, and your journey back home. You will end up spending right, and you will avoid all the inconveniences often caused by traveling without a plan.